National University (NU) Honours Admission Notice 2017-2018 has been released. In this year from 24th August 2017 National University (NU) Honours Admission system will be Starting. So students will apply in National University (NU) Honours Admission 2017-18. Students can apply from National University Oficial Website www.nu.edu.bd. And we will provide you all about admission information and admission apply system. So read this article and I think this article will help you. Let’s see. National University Honours Admission published date 24th August 2017. National University (NU) Honours Admission will be starting on Thursday 24th August and the last date of application is 21st September. And National University (NU) for the academic session 2017-18 1st-year class will start on 15 October. 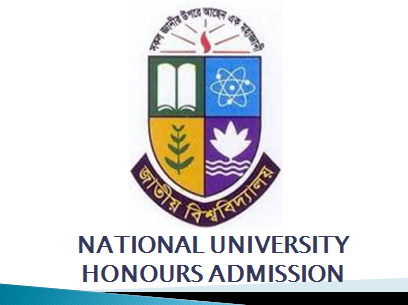 Now we will provide you the National University (NU) Honours Admission Rules and how much need student educational qualifications for applying. At first, the student who passed the SSC or equivalent exam of 2014 and 2015 and HSC exam in 2016 and 2017, then the student will apply National University (NU) Honours for admission. The applicant will have to get at least CGPA 2.00 in the 4th subject. Applicants will be maximum 22 years old. National University (NU) Admission Seat Number. There are 2,28,645 seats for National University (NU) Honours 1st-year admission. And all education board division base seat list is given below. If you have any problem and any question please comment on the comment box. We will try to response you as soon as possible. For more educational information visit our website and get more updated news daily. Again Thanks, everybody. Stay With Us. vocational can't apply?it's saying under prosseing.